The developers of Pocket have shared some interesting stats around Apple’s latest product releases with us. The web content clipping service is already seeing 20 percent of its daily app traffic coming from the just-released iPhone 5, and 60 percent coming in from devices with iOS 6 installed. That may sound like a lot, but after Apple announced 100 million iOS devices already updated to iOS 6, and over 5 million iPhone 5s already in the hands of consumers, it’s not so much of a stretch. We’ve also seen other data from developers, ad networks, and analytics firms that indicates iOS 6 adoption is high, but the iPhone 5 numbers are also huge. It suggests that developers should have an iPhone 5-ready version of their apps out to the public as soon as possible (as Pocket does), because those users are clearly interested in finding and using software for their newest gadgets. Less than a week after Apple’s introduction of its new iOS 6 and iPhone 5, we’re already seeing rapid adoption of the new software—as well as evidence of just how briskly the new device is selling. The above chart shows the proportion of daily active Pocket users on each of the Apple iOS versions. 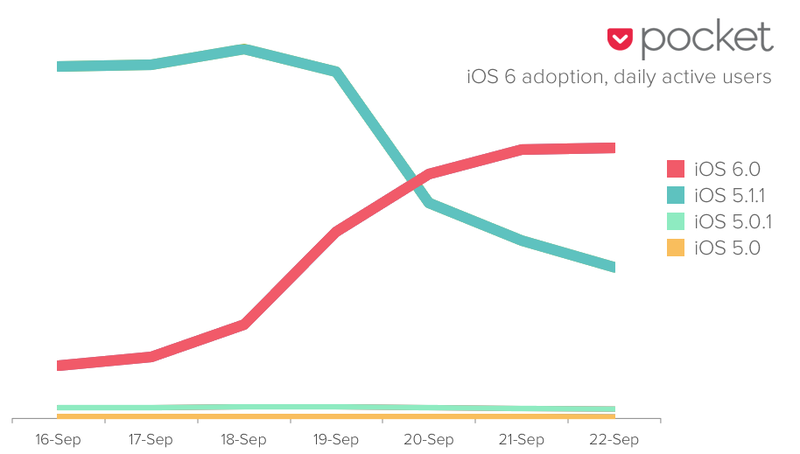 By the end of this weekend, 63% of our iOS users were already on iOS 6. Pocket users are also snapping up the iPhone 5—not a surprise given the latest sales numbers. 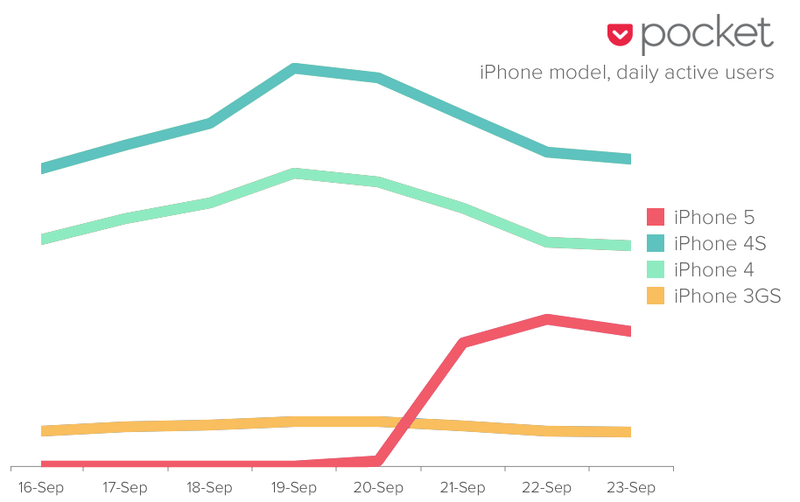 Over the weekend, 20% of Pocket’s daily iPhone users were accessing Pocket from an iPhone 5. Of course, some of that popularity can be attributed to promotion of Pocket alongside the new device, but we’ll continue to keep a close watch on its popularity.